The Hawaii Department of Transportation (HDOT), Harbors Division, celebrated the blessing of Hilo Harbor’s newly completed Pier 4 cargo wharf project, the Pier 1 cargo yard and passenger terminal improvements. The projects are designed to increase operational space and increase cargo handling efficiencies. The improvements to the passenger terminal will create a more pleasant and comfortable environment for cruise passengers. The Hawaii State Department of Education (HIDOE) and TransPar have saved the state approximately $13 million annually through the Get on Board student transportation initiative. From 2013 to 2017, Hawaii public schools’ student bus transportation system underwent a comprehensive transformation, including the development of new procurement methods and contract models. Another key milestone for the four-year project involved incorporating new technology and the implementation of computerized routing software, GPS mapping and tracking, and the addition of video cameras to all school buses. What started as a pilot project for 32 Central Oahu schools in 2013, has now grown and expanded statewide. During Phase 2, the program provided student bus transportation to all schools on Oahu, the Big Island and Molokai. Earlier this year, HIDOE successfully implemented the final phase of its Get on Board initiative with the awarding of new contracts on Maui and Kauai for the 2017-18 school year. Now that the rollout has been completed, HIDOE and TransPar are focused on establishing the systems and process that support continuous improvement and sustainability. By using the technology acquired and process improvements implemented in the Get on Board initiative, the most efficient level of service continues to be provided to students. For more information about Get on Board, please click here. 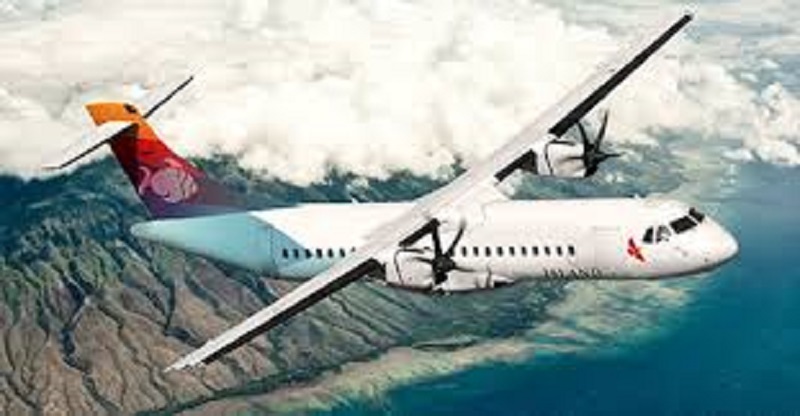 Hawaii Island Air (Island Air) announced on Thursday, Nov. 9, that it will be closing operations as of 12:01 a.m. Saturday, Nov. 11, 2017. As a result of this announcement, all Island Air passengers must make alternative arrangements for interisland transportation, effective this Saturday, Nov. 11, 2017. Earlier this month, Island Air was forced to file for Chapter 11 bankruptcy protection (see link below) in an effort to continue operations following threats of legal action by the lessors of Island Air’s aircraft to ground and repossess the company’s fleet. Island Air was unable to locate a new investor or lender to provide funding to support airline flight operations and a successful reorganization. One of the difficulties of attracting new investors was the aggressive legal attacks by Lessors Wells Fargo Bank Northwest, N.A. and Elix 8 Ltd. Although Lessors’ Motion for Temporary Restraining Order was denied by Judge Robert Faris of the District of Hawai‘i Bankruptcy Court on Friday, November 3, Lessors continued to engage in multi-directional legal attacks which Island Air could no longer combat without additional financing. The aircraft lessors were seeking termination of all leases and immediate repossession of all aircraft. 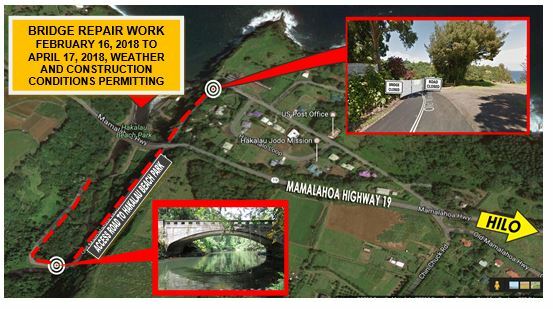 As of 10:30 today, Bayfront Highway remains closed between Pauahi Street and Waianuenue Avenue due to high waves washing debris on highway. Use Kamehameha Avenue as an alternate route. A 49-year old Hilo man died following a 2 vehicle crash Saturday morning (October 14), in the district of Hāmākua. Responding to a 7:21 a.m. call, police determined that a 2001 Dodge Caravan was traveling westbound on the Daniel K. Inouye Highway (Saddle Road), near the 38-mile marker when he was overtaking vehicles and struck a 2015 Honda Fit that was traveling eastbound. The man who died was taken to the North Hawaii Community Hospital where he was pronounced dead at 8:42 a.m. 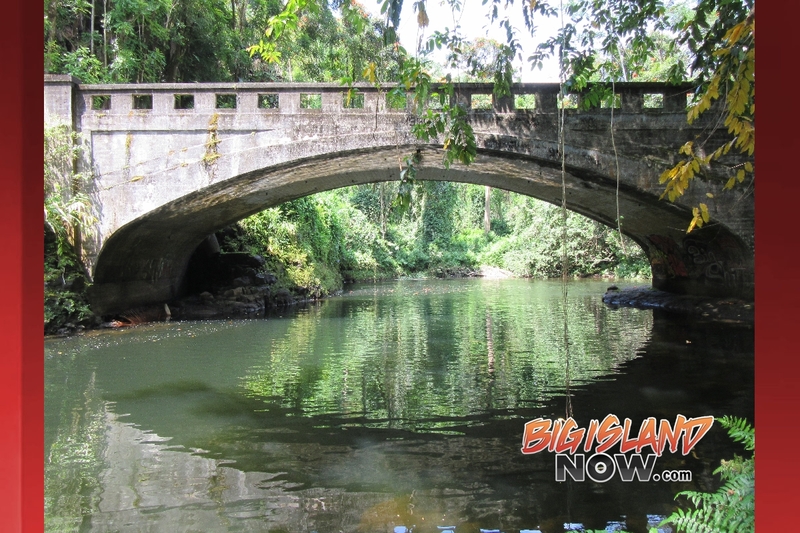 The driver of the Honda, a 36-year old female of Mountain View, was also transported to the North Hawaii Community Hospital for her injuries and was listed in critical condition. Police believe that speed was a factor and the man was not wearing a seatbelt. The female was wearing a seatbelt. Police do not believe that drugs or alcohol were factors in this crash. This is the 27th traffic fatality this year compared with 23 at this time last year. Ali’i Drive by Likana Lane to King Kamehameha Hotel, Kailua, Kona, from 8:00am today until Sunday 10-15-17 at 2:00 pm. AVOID the Bayfront Highway between Pauahi Street and Waianuenue Avenue due to high waves washing debris on highway. An assessment will be made in the morning by Civil Defense on the status of the closure.